One in three aging adults falls every year. According to the Canadian Institute for Health Information, unintentional falls cost more than $2 billion in direct healthcare expenses in 2016-17. Researchers at the University of New Brunswick are partnering with Horizon Health Network and Fitness NB to recruit participants for Zoomers on the Go, a free fall prevention education and exercise program for people 50 years and older. The 12-week exercise program will be coming to multiple locations throughout Fredericton and surrounding areas in spring of 2019. It aims to help aging adults meet current physical activity guidelines by offering two 60-minute sessions per week involving aerobic and resistance exercises, as well as flexibility and balance activities. Dr. Danielle Bouchard, assistant professor in the faculty of kinesiology at UNB and co-director of the Cardiometabolic Exercise & Lifestyle Laboratory (CELLab), is leading a team of UNB researchers that will evaluate the participants’ health outcomes and participation benefits. Dr. Bouchard believes Zoomers on the Go offers endless potential for the province toreduce the rate of falls in the aging adult population of New Brunswick. 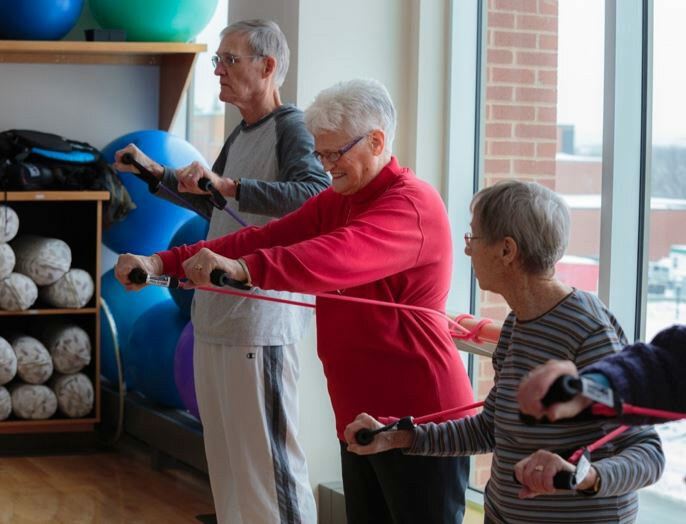 The program will not only increase their ability to remain independent, it promotes social inclusion by bringing aging adults together in their communities through exercise and social networking opportunities to combat isolation and forge lasting friendships. She stresses it’s necessary to allocate the limited public funds available to programs with actual evidence-based results for benefits of participation. The exercises in the Zoomers on the Go program are scientifically proven to improve participants’ strength, which leads to better balance to reduce the risk of an unintentional fall. Based on preliminary findings, Dr. Bouchard and her research team reported a 10 per cent improvement in participants’ strength and balance scores after 12 weeks in the Zoomers on the Go program. Zoomers on the Go is currently recruiting individuals, age 50 and over, who would like to participate in the exercise program. The program is free to all participants and will be offered on the north and southside of Fredericton. All participants will be pre-screened to ensure it is safe for them to engage in exercise. To register for Zoomers on the Go, please contact Anna Petrie by phone at 506-458-7034 or email cellab@unb.ca.